Low-Carb Egg-Crust Vegetarian Breakfast Pizza has a lot of pizza toppings on an eggy crust, and this delicious pizza is low-carb, Keto, low-glycemic, gluten-free, South Beach Diet phase one, and vegetarian! Use the Diet-Type Index to find more recipes like this one. 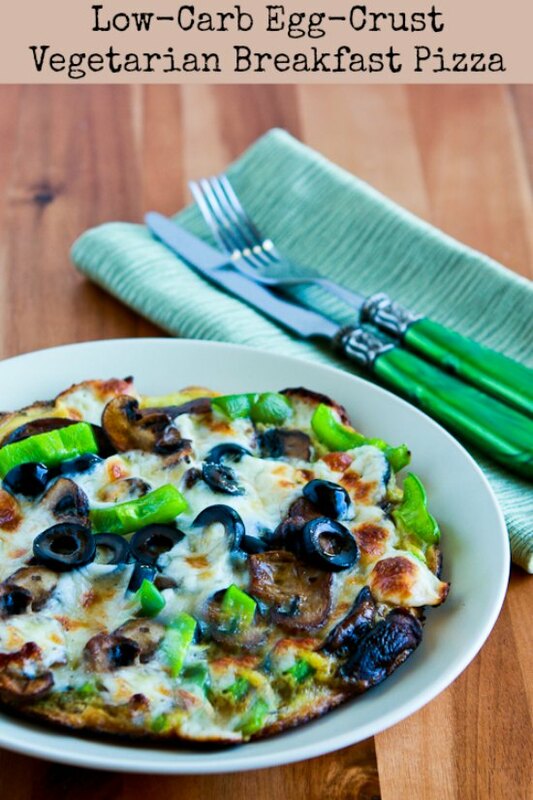 Click here to PIN Low-Carb Egg-Crust Vegetarian Breakfast Pizza! When I posted my Egg-Crust Breakfast Pizza with Pepperoni, Olives, Mozzarella, and Tomatoes a few people asked why it was not called a Frittata. (If you’re not familiar with Frittatas, they’re a type of Italian omelet that’s cooked partly on the stove and then finished under the broiler.) These Breakfast Pizzas that I’m having fun experimenting with are made with just two eggs and the egg is about half cooked before the pizza topping ingredients are layered on top. Then the Breakfast Pizza is cooked for a few minutes with a lid on and browned under the broiler so the cheese is melted and golden-brown. There are similarities, but frittatas have much more egg in proportion to other ingredients, while the egg part of the Breakfast Pizza really is more like a “crust” with the other ingredients added on top. This Low-Carb Egg-Crust Vegetarian Breakfast Pizza was just as delicious as the first one, and I’d enjoy this for a Meatless Monday breakfast, lunch, or dinner. There are other ingredients you could use for a vegetarian version of my Breakast Pizza, but I settled on mushrooms, green onions, and olives. Whatever ingredients you use, don’t skip the dried Oregano for that “pizza” flavor. Use Meatless Recipes to find more Vegetarian Recipes. For more Meatless Monday ideas from other bloggers, follow our Meatless Monday board on Pinterest. When mushrooms are done add a tiny little more oil, heat the oil, and add the eggs. Season eggs with dried oregano and Spike Seasoning (or another all-purpose seasoning blend if you don’t have Spike.) When the egg mixture is about half cooked, layer on mushrooms, bell pepper, olives, and cheese. Cover the pan and cook 3-4 minutes, or until the cheese is melted and the egg is nearly all set. Here’s how mine looked when I put it under the broiler. I broiled this about 4 minutes in my little toaster oven but it would only take 1-2 minutes in a large oven broiler. Low-Carb Egg-Crust Vegetarian Breakfast Pizza has a lot of pizza toppings on an eggy crust. Wash mushrooms if needed, dry with paper towels, and slice into thick slices. Heat 2 teaspoons of olive oil in a small 8 inch omelet pan, add mushrooms, and saute over medium-high heat until the mushrooms have released their liquid and are lightly browned, about 6-7 minutes. Remove mushrooms to the cutting board. While mushrooms cook slice the olives, slice the bell pepper, cut the mozzarella into chunks, and beat the eggs. Get the dried Oregano and Spike Seasoning ready. Then add half the mushrooms, half the green peppers, olives, and half the cubes of cheese, followed by a second layer of mushrooms, green pepper, olives, and cheese. Cover the pan and cook 3-4 minutes or until the cheese is fairly melted and the eggs are nearly all set. You’ll need an 8-inch nonstick omelet pan to make a breakfast pizza that looks like mine. (When I used a bigger pan, I didn’t like it as well. I used this Calphalon 8-Inch Nonstick Omelet Pan, which is one of my favorite pans. 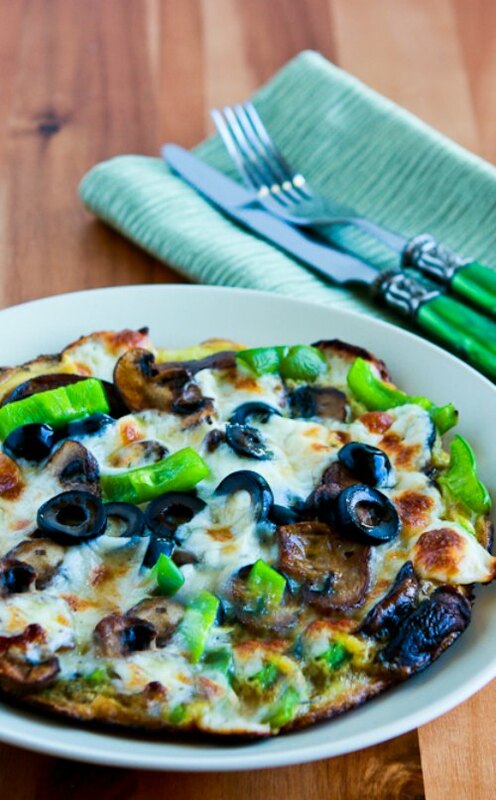 This Low-Carb Egg-Crust Vegetarian Breakfast Pizza is made with all low-carb and low-glycemic ingredients, making it a great choice for any phase of the South Beach Diet. Be sure to use low-fat cheese if you’re making this for South Beach. This recipe is also great for other types of low-carb diets, most of which would prefer full-fat cheese. This is the worse set of recipes to follow!!!!!!!!!!!! Marie, I am afraid I have no idea what you mean by that? Thanks for catching that, just fixed it. Glad you enjoyed it! This was definitely one of the best recipes for Phase 1. I see that you left out when to add the olives in both the picture directions and the directions down below. It is pretty easy to figure out but a new cook may panic!! Love the idea of an egg crust!! What a great idea this is, Kalyn – what a great veggie- packed breakfast, and so unique! This would totally be a dinner option in our house too – I love eggs for dinner. Thanks Carla, Joanne, and Jeanette. Hope you guys enjoy! This is becoming my new favorite breakfast. I do love your idea of an egg crust Kalyn – going to make a breakfast pizza for the kids this morning and dig out some toppings from my fridge. Thanks for the inspiration! Some days I really want pizza but not all the carbs and calories! Perfect option, right here. What a great idea! With the toppings on top instead of midst the eggs, this will really bring out the flavor. Whatever hits your tongue the most, you taste the most. Yum!